Not even a full month into 2006 and a stream of whispers were rippling through the vintage Japanese vinyl collecting community regarding the emergence of the mysterious Phantom Collector. A seemingly well-versed aficionado of the scene, he didn’t strictly embrace the city-stomping kaiju creatures that most appreciated but also the masked humanoid heroes that fought these monsters. But his true passion was proclaimed as finding figures from the little-known Captain Maxx program, a television show that was canceled after the broadcasting of one episode on New Year’s Eve in 1970. But this was all smoke and mirrors, an entertaining history that never existed, a ruse that led to the true debut several months later of the Captain Maxx figure from Max Toy Company. And the Phantom Collector was revealed to be the actual artist that created the character, a man named Mark Nagata. An accomplished commercial illustrator for over a dozen years, Nagata’s career had culminated with the painting of covers for the Give Yourself Goosebumps and Graveyard School book series. Seeing digital artistry beginning to overtake his chosen field, Nagata shifted paths to something he’d been passionate about practically his whole life: vintage Japanese monster & hero toys. In 1973, the then-nine-year-old Nagata received a Christmas present from his aunt and uncle who lived on a U.S. military base in Japan, the package filled with sword-wielding lion-men, flame-encrusted monstrosities, and similarly strange creatures. Refinding these vibrantly colored toys during his college days, Nagata began a collector’s journey that included scouring local antique shops, rummaging through trade shows, and exchanging pieces with fellow connoisseurs online. Amassing not only an impressive collection but also a yearning for learning the history behind these Japanese pop culture pieces, Nagata’s passion not only inspired him artistically but also helped him define his cultural identity as an American of Japanese ancestry. And it was this direction that would steer his post-millennial professional shift, leading him to become a founder of the Super7 brand. Flourishing from their magazine-based roots into a storefront and production company, Nagata departed from Super7 after about four years in order to make his own vintage Japanese toy inspired universe. Beginning with a heroic protagonist like those seen on television shows such as Ultraman, Android Kikaider, and Giant Robo, Nagata’s Max Toy Company venture launched with the Captain Maxx figure, which was modelled after Nagata’s son Max. With the first round of characters already designed and in production when he started the company, Nagata’s line quickly grew to encompass monstrous threats for the hero to battle, kaiju creatures with names like Alien Xam, Eyezon, and Tripus. With these earliest Max Toy Company works produced in Hong Kong by Kim Fung Wong’s ThreeZero, the brand’s later output appropriately shifted to being made in Japan through traditional methods. And over the next decade, Nagata’s Max Toy Company evolved to embrace imaginative ideas well beyond its hero vs kaiju roots, though the artist never stopped revisiting his personal collection to gain inspiration and insight into how the forms should be designed, produced, and even decorated. 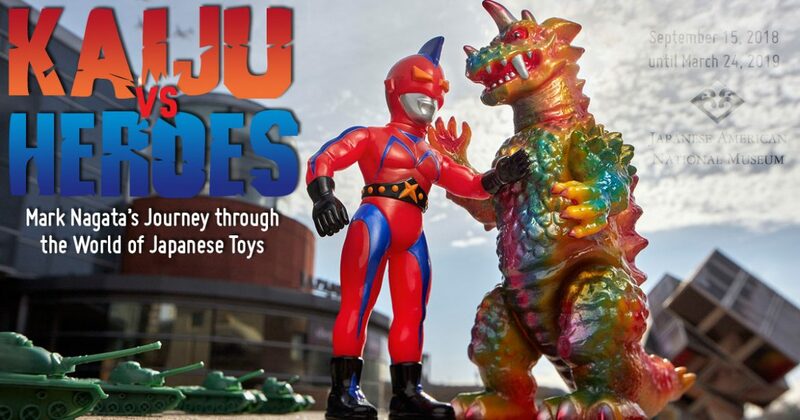 Bringing the influencer and the influencee together, Kaiju vs Heroes: Mark Nagata’s Journey through the World of Japanese Toys features hundreds of pieces from the artist’s extensive personal collection, including everything from vintage originals to the contemporary vinyl art that they’ve inspired. To coincide with these works being exhibited at the Japanese American National Museum, Nagata has arranged to issue a small selection of pieces through the institution, including two hand-painted editions of Marusan Toys-produced forms, the company that created some of the first vinyl kaiju and hero toys of the 1960s. For those able to attend this exhibit, they will not only be able to visually trace the history of a cultural phenomenon but also of Nagata’s personal craft, an overview of the art and the toys that have influenced Nagata’s journey since childhood. For its opening day reception on Saturday, September 15th, there will be an exhibition tour with Mark Nagata at 10:30am available only to those with a museum membership, followed at 2pm by an open to the public discussion with Mark Nagata and Marusan Toys‘ company President Eiji Kaminaga about kaiju toy history, the world of Japanese toy collecting, and their companies’ histories. All works in this exhibition will remain on display until March 24th, 2019 at the museum’s physical location (100 N. Central Ave., Los Angeles, CA 90012).